Fair. Writing on inside page Some small signs of general wear Some slight wear to the cover. Very Good. As Sure as the Dawn: v. 3 (Mark of the Lion) by Rivers, F., 1995-05-31. Trade paperback (US). Glued binding. 512 p. Mark of the Lion, 3. Good. 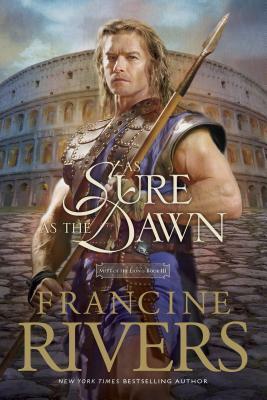 As Sure As the Dawn (Mark of the Lion) by Rivers, Francine, 1995-05-31. Trade paperback (US). Glued binding. 512 p. Mark of the Lion, 3. This was an excellent ending to an incredible series by Francine Rivers. She really brings each character to life. She challenges you with the struggles each character faces, in a way that makes you reflect on how you would have handled it yourself. Excellent! Highly recommended! This third book in the Mark of the Lion series is a fitting conclusion. Set in first century Rome, this one follows Atretes, the German, who had been sold into slavery and forced to be a gladiator for the sport of Rome. He earned his freedom and then set out to find his son. He was adopted by a Christian widow. He agrees to let her continue to care for him until he is weaned. He also sets out for home and takes Rizpah and his son Caleb on the long trek back to Germania. They are accompanied by Theophilus, a former Roman Centurion turned Christian who feels called to share the gospel with the people in Germania. There is great animosity towards Theophilus by Atretes and the journey is difficult, but when Theophilus saves Atretes' life three times, Atretes soon counts him a friend. Meanwhile, Atretes and Rizpah fall in love and marry. The real difficulty comes once they arrive in Germania and begin to share the gospel. It's a great missionary story and Rivers tells it well. She doesn't make the conversions unrealistic and fast, but shows the struggles people have with believing and the opposition to the gospel from many fronts.